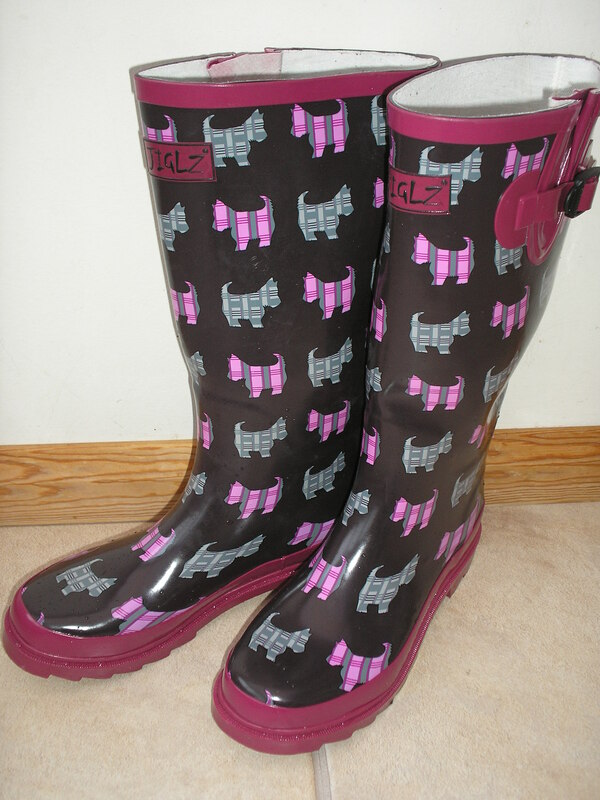 Have you noticed how coloured and patterned wellies have become the norm nowadays, in fact they could be classed as a fashion accessory? I must admit that until a week ago, the only wellies I possessed were of the ‘green’ and, quite frankly, boring variety and had only been used when cleaning the car. I think someone gave them to me and, being a size 7, they are much too big, requiring vast socks to fill them up enough for me to walk without losing them! There is no way I would have worn them out in public. The recent awful weather has changed all this. On a visit to The Range I spied a selection of very attractive boots of the welly variety and took a long time choosing between sensible-ish black ones with a red sole and white flowers down one side, all over liquorice allsorts, stripy, spotty and flowery and settled on the only ones that fitted my colour scheme – purple and pink. They have little scotty dogs all over in pink and grey on a dark purple background and are just gorgeous (well I think they are!). To go with them a pair of bright pink socks called ‘Heat Holders’ which are fleecy inside right down to the toes – I couldn’t wait for it to rain again!! Today they were christened in a torrential downpour in Worthing. No soggy wet feet for me – just dry and cosy toes. Bring on more horrid weather and I might be seen wearing them into the office! !